Hannibal is a town rich with history. Discover our remarkable past by exploring a Hannibal history museum during your stay. Perhaps best known as the boyhood home and inspiration for Mark Twain, Hannibal is home to the Mark Twain Boyhood Home & Museum, as well as other history museums where visitors can explore the rich past of this great river town. The Mark Twain Boyhood Home & Museum is a must-see in Hannibal and has been a tourism destination in the city for more than 100 years. The Mark Twain Museum is full of exhibits and home to spectacular storytelling performances. Enjoy an inside look at the childhood home of one of history’s most influential literary figures. Learn more. The turn-of-the-century Rockcliffe Mansion is one of many impressive Hannibal Tours. This breathtaking castle houses many original furnishings, priceless Tiffany windows and a fascinating history. Learn more! Mark Twain is not the only historic figure to call Hannibal home. Unsinkable Molly Brown was a Titanic survivor on her way back to Hannibal when the iconic ship sank in 1912. This Hannibal history museum allows visitors to learn more about her fascinating life and see her birthplace. Open seasonally, Jim’s Journey Freedom Center is Hannibal’s newest museum. The Freedom Center details the history of African Americans in Hannibal, linked back to the novels of Mark Twain. The museum highlights the lives and accomplishments of prominent African Americans from Hannibal, and is conveniently located close to the Mark Twain Boyhood Home & Museum Properties. No two trips to the Hannibal History Museum are alike. The Hannibal History Museum is constantly updating its exhibits and holds exciting festivals throughout the year. Admission to the Hannibal History Museum is always free, making it a must stop on your visit to Hannibal. Learn more. This Hannibal museum takes visitors back to the golden age of railroads and toy trains with an impressive collection of memorabilia. Train lovers will not want to miss the Big River Train Town & Museum on their next visit to Hannibal. Now open! Take a tour inside Hannibal’s newest car & pop culture museum! 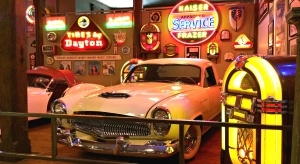 Karlock’s Kars & Popular Culture showcases a collection of several classic cars and iconic items from famous movie props to Steve McQueen’s motorcycle! Learn more about this fascinating exhibit!